Thames Discovery Programme - You Are Not Alone! For the hundreds of FROG members and volunteers who have worked on the many different sites located along the foreshore of the River Thames; the thought of what must lay undiscovered just a few tantalising metres away beneath the water line must be a very often and yet frustrating thought indeed. 270 miles due north however, a 60 mile long river, fed from its source near Wearhead high up in the Pennines just happens to pass through a medieval city. Its course takes it around a remarkable bend and rocky peninsular on which stands a World Heritage Site. Of course I am talking about the beautiful City of Durham with its stunning Norman Cathedral and Castle. Fortunately the river water here; for an average 9 months out of 12 runs relatively clear. It is because of this underwater visibility that I have been able to recover artefacts from below the waterline; directly from the deepest parts of the river. 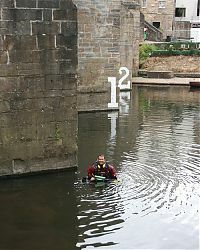 The River Wear at Durham City is not tidal, its flow is slowed significantly by a series of weirs; the same weirs also artificially increase its depth upstream to an average 2 metres. Tranquil as it often appears the river can rise by 4 metres during times of great flood. These powerful surges have on several occasions swept away many bridges in the city, most notably in 1771 when both Framwellgate and Elvet were both significantly damaged. Not surprising then that the built environment of Durham spanning its early Norman origins though to the present day centred very closely on the two main bridges; Framwellgate and Elvet. Christophe Schwyter’s map of 1595 illustrates nicely how the bridges even then were essential to tradesmen, pilgrims, and craftsmen as main thoroughfares gaining them access through the high city walls. 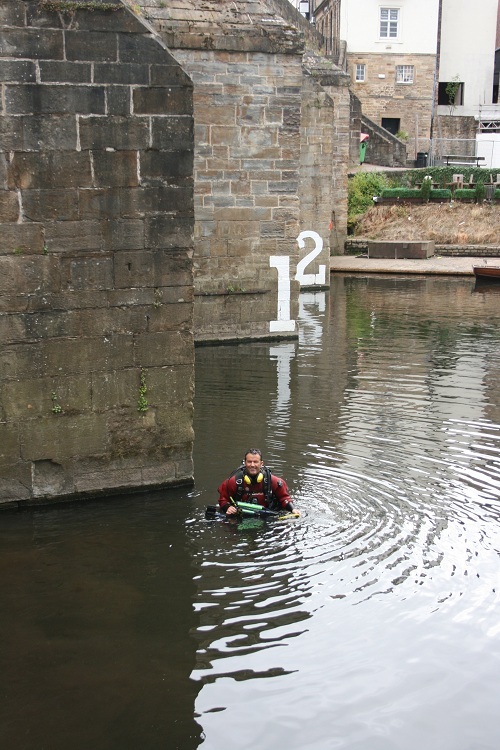 You may have guessed by now that due to the rivers depth that the Medieval and post-Medieval artefacts that I am recovering are not found by plodging through mud but done so using sub-aqua diving equipment. The river bed around the peninsular is in the main sedimentary sandstone cut through over the centuries by small riverlets each forming narrow deep gullies. Similar geological features can be found in abundance many miles upstream near Frosterly or Wolsingham. The artefacts are in the main recovered from within these gullies, each of which formed so long ago now act as natural guardians against the powerful floods. Remarkably preserving the small artefacts in an anaerobic layer deep under sand, grit, pebbles and small boulders; in a location perhaps just a few metres away from where they actually first entered the water. Following the introduction of the Public Health Act in 1848, George Thomas Clark, Superintending Inspector submitted a report to the General Board of Health. While the report proved pivotal in reducing the excessive mortality rate and provision of proper sanitary remedies for Durham. It also captured the remarkable interaction of the citizens with the River Wear as it flows around the peninsular on which much of the City of Durham stood. The Vennel, a close passage leading to the river, is in a filth state, and the adjacent arch of the bridge is used as a receptacle for the ashes and night soil of the whole quarter. It is this interaction or the bringing of people in to direct contact with the river that owes so much to the fact that artefacts from across the centuries still lie very close to where they first entered the water. Rebuilt and subsequently widened, the two bridges each now over 800 years old still survive to this day, and have over the last three years proved the focal point for my underwater archaeological research. 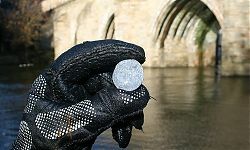 The parallels in terms of type’s of artefacts recovered here in the River Wear in Durham with those recovered from the River Thames foreshore and those found in moat-fill excavations on sites located on the banks of the Thames is significant. 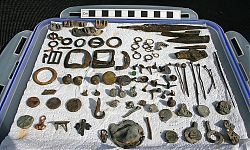 Pretty much everything recovered will be instantly recognisable to the FROG members as they will have almost certainly found similar items. However, the condition of the Durham finds may well be superior as the anaerobic layer at the bottom of the gullies that the finds are recovered from has greatly assisted in there preservation. To date my full assemblage totals just over 2000 different artefacts made up of such items as; military insignia, lead toys, hammered silver coins (including only the second Henry VIII hammered silver coin from the Durham Palatinate mint ever to be found within the boundaries of Durham City), cloth seals, lead tokens, pit check tokens, Nuremburg jettons, medals, medallions, gold and silver rings, coin weights, brooches, bottles, badges, pocket watches, bracelets, earrings, buttons, buckles, candle snuffs, spindle whorl, scissors, printing press items, keys, sword fittings, clay pipes, whistle’s, pins, needles and cutlery even hand grenades, daggers and pistols. My personal favourites are a 12th Century horse harness pendant with an inscription AVE MARIA GRACIA, a rare unrecorded example of a bronze medallion bearing the image and name of St Augustine – the 1st Archbishop of Canterbury and a 13th Century Armorial Seal matrix with a motive around the edge of the seal in Latin which reads S IOHIS DE INSVLA which is short for Sigillum Iohannis de Insular. Translated into English this reads as the seal of John Delisle or John de Lisle, a family that were possibly members of minor nobility. 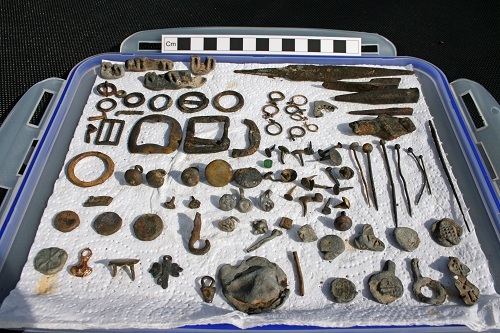 Perhaps the most significant aspect of the assemblage is the number of lead cloth seals that have been recovered – currently standing at 171 different seals. It was actually these cloth seals that in September 2010 first encouraged the late Geoff Egan (formerly Museum of London, British Museum and the Portable Antiquities Scheme) to travel to Durham where he spent two pretty intense days identifying the origins of the cloth seals. Before I discovered the first of my cloth seals only two had been recorded previously on the Portable Antiquities Scheme (PAS) database as being found in the North of England. Geoff was able to identify examples from the following places; London, Norwich, Yorkshire, York, Douai (Northern France), Augsburg, Malines (Belgium), Ypres (Flanders cloth from Belgium), Haarlem (Netherlands), Tours (France) and Rouen (France). ‘This list demonstrates the wide reaching trade networks that Durham was linked into. The cloth no longer remains but the seals do and so allow us a window into this busy industry which brought trade, people and wealth to the city’ (F, McIntosh 2011). The London cloth seals in my collection often contain a madderbag (which appears on the Dyers Company arms) evidence perhaps that these died cloths originated from the Southwark waterfront areas. 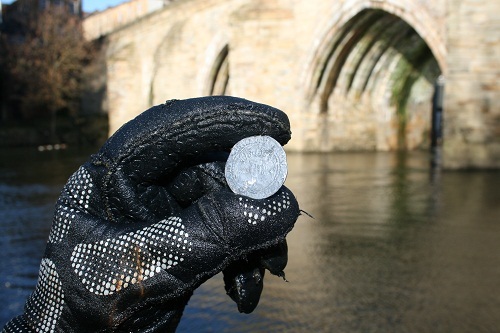 The discovery of my first Medieval artefact in the river occurred in 2008 and came hot on the heels of the discovery of some religious artefacts the previous year by my brother Trevor and me also in the river. The religious artefacts actually belonged to none other than a former Archbishop of Canterbury. However, that is a story for another day; although if you are interested Maev Kennedy who took the trouble to travel to Durham and gather the facts for herself wrote the most accurate of all the press stories and which was published in the Guardian. The legacy of the assemblage will I am sure amount to something special in terms of archaeological research for many years to come. For the last 3 years many finds have been loaned to Durham University Archaeology Department where MA students have endeavoured to identify and research them as part of their studies. Working very closely with my Finds Liaison Officer; Frances McIntosh, so far 350 artefacts have been added to the PAS database and many more will follow in the months and years ahead. From September 2011 to January 2012 around 100 dress accessories, and other items linked to craft, to trade and belief will form part of an exhibition of Durham’s past in the Palace Green Library in Durham. Dialogue has already taken place with a view to placing the bulk of the assemblage on display at the Museum of Archaeology in Durham which, as the museum stands on the banks of the River Wear in Durham City would prove a fitting resting place for the artefacts which in many ways represent snap shots in time from the Tudor, Stuart, Georgian and Victorian periods. For me the assemblage has unexpectedly opened up a whole new world and one that has sent me off in a new direction of research. I am set to start a degree in archaeology at Durham University this October and hopefully then go on to do some serious research in to the cloth seals – I may perhaps one day go on to produce an Occasional Paper! Finally, I would like to take this opportunity to go on record and thank Frances McIntosh for her unbelievable support throughout the last three years. Her professionalism, knowledge and enthusiasm are infectious!